May 15, 2011. its a rainy day so that means Dolphin Field Investigators get to track down old leads and tie up loose ends. Several months ago Art Krause, Abbie Burgess told us about this boat somewhere up the west coast of Penobscot Bay, Maine, but somehow we never got the time to track her down. Today, with a little help from the folks at Google's search engine we found and spoke with Nick Apollinio. Nick had this boat for about 2 years - "a nice boat" - in the mid 1990's, keeping her in Rockport Harbor on a mooring. He said she had a white hull and an outboard motor bracket on the transom - and does not recall seeing a outboard well in the transom, or a prop aperture in the rudder - it may have been filled in as this boat had a Vire inboard at one point. Nick sold her to someone from New Brunswick, Canada (hmmmm...we may have something here... we did, filed under boat number, not boat name. Click here for the New Brunswick, Canada link). Nick bought her from Pete Brown of Camden, Maine. We are trying to get in touch with Pete. 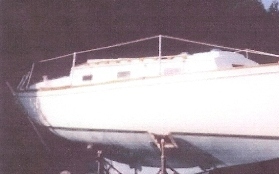 This boat was originally Rheinhard Sarges' Velero Pending receipt of a photo of her as Whimbrel we'll use Velero's photo shown at left. May 16, 2011. Another rainy day!! I spoke with Pete Brown today, who told me I should talk to his wife - it was her boat - and the reason why he married her! During a heavy downpour here in Old Lyme, CT I had a wonderful conversation with Joy Brown. She bought Whimbrel in the early 1990's from Bob Smith who lived in or near St George/Thomaston, Maine. Bob had the boat for several years and Joy crewed for him. After Joy bought Whimbrel she moved her to Camden (Camden YC), Maine where she was kept on a mooring. The boat had an outboard on the transom. Joy has pictures and will send them in. It's still raining so we are trying to get in touch with Bob. May 16, 2011. Still raining here in Old Lyme, CT! I talked to Bob Smith. 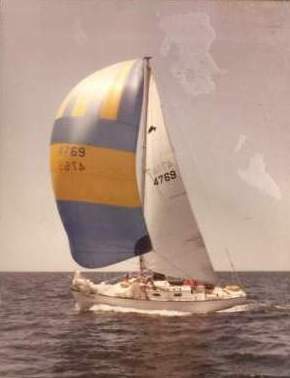 He reports that he bought Whimbrel sometime in the mid/later 1980's from a guy who had bought her in Connecticut. When he bought her she was ashore in Rockland, and she had an outboard motor on the transom. He kept her on a mooring in front of his house on the St George River. Bob has pictures and will hopefully get back to us with more details. There is probably a story here about how Whimbrel got to to Maine - and we are closing in on it. Bob mentioned that he still has an old Dolphin mainsail with the little dolphin on it - I'll bet its the very one in the picture above. Bob also mentioned that he is pretty sure he saw Whimbrel up in Gagetown, New Brunswick a few years ago. He noted that she now had a portlight at the front of the cabin house! This adds an interesting tidbit. Here is a picture of Whimbrel as she appeared in the For Sale ad a few years ago. Sure enough that portlight is peeking out just above the toerail. It seems that someone added this portlight after she arrived in New Brunswick. This portlight location is a classic marker for an O'Day or Lunn built boat. The broker's ad clearly indicated that this boat was a Yankee, hull #117.